The artist of the USSR era Nikolai Romadin painted landscapes of all the expanses of the republics, sometimes drawing an attentive studying look at the magnificent architecture of Europe. But more often he returned to his native heart of Russia and described its modest, but rich and mysteriously picturesque nature. “The first bloom” – the creation of 1956. In the picture there is no plot, no human life is noticeable. Even the color of the canvas, at first glance, is monotonous. But if you take a closer look and feel full of soul in the image shown, then the warmth and joy will take hold of the mood, because the arrival of spring is a real holiday. We see a small river in the picture with fragile and graceful trees along its banks. In the distance, the meadow spreads and ends in a darkening dense forest. The mirror-like smooth surface catches reflections of blossoming branches. The first tender leaf greens blissfully bathed in the warming sunshine. Pastel blueness shines through the cloudy sky wool. Cloth ugly, unclear, but so radiant and dear! The Soviet landscape painter was influenced by the Impressionist comrades. This fact is clearly guessed in the “First Bloom”. 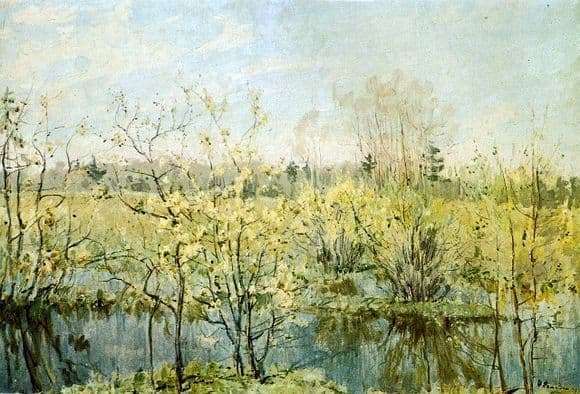 The author of the masterpiece caught the moment of the arrival of spring, stopped in anticipation of the riot of nature and shares with the audience a quiet, tender feeling of serenity. N. M. Romadin art experts are compared with the poet Yesenin. Their burning hearts are fascinated by the Russian land, they beat and create for Russia. The creations of these great people convey a beautiful symbolic image of their native lands and charge them with incredible love and respect for them. The work “Bloom” of the artist – this is the first song in the spring; This is a farewell dark and dirty late winter. Fatigue from the gray landscape gives way to a triumphant triumph at the sight of blooming buds. A lively picture lures audiences into its spaces, enchanting with delicate spring aromas and gently makes one think about the transience and pricelessness of moments of life.